I interviewed a woman who had lived in Death Valley for a good part of her adult life. 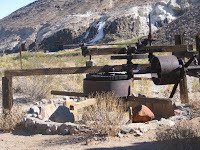 She had been the camp cook at the Grantham Talc Mine located at Warm Springs in the southwest corner of the park. She inherited quite a sum from the estate of one of the partners of the mine and was living in Laguna Beach at the time of the interview. Ernie Huhn was the name of that partner whom some called Siberian Red. He’d prospected in Siberia and Alaska before arriving in the lower forty-eight in 1905. He exemplified the well rounded gambler, prospector, geologist, and miner of his time. The story of Siberian Red’s lost ledge began at Summit Diggings east of Ransburg in 1925. A man named Asa Russell approach Ernie Huhn with a proposition. He would grubstake a trip to the Panamint Mountains if Ernie would take him along and show him how to find gold. 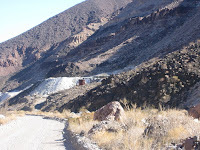 Ernie agreed and with supplies to last a month they headed into Death Valley, up through Anvil Canyon and across Butte Valley to the base of Panamint Mountains where they set up camp. For the next month, they prospected along upper ledges of the range taking rock samples as they went and hauling them back to camp then spending evenings testing each one by crushing and panning it down hoping to see signs of gold, silver or copper. This went on for weeks without finding anything worth further testing. Finally, on one fateful afternoon they returned tired and with mounting disappointment. They placed their samples on a shelf in the tent without running the usual tests. The next day they headed for Shoshone the nearest settlement to have some fun and buy provisions. Weeks passed before the two returned with a renewed desire to keep on prospecting. It was mid afternoon when they arrived back at camp. Ernie began testing the samples from the last outing. One clump was gray in color and heavy for its size. When crushed and washed, flakes of gold covered the bottom of the pan. Ernie tweezed the flakes out of the pan, placed them on his miner’s scale and calculated the value per ton of the find. He couldn’t believe what the numbers told him -- $15,000 per ton at the going price of gold -- beyond all belief! As you can imagine, the two passed a sleepless night talking about the riches that soon would be theirs. By daybreak the next day, Ernie took to his well worn trail and headed up to the exposed ledges and outcrops that he and Asa had worked for weeks. It was Ernie’s sample that had shown the riches and so he led the way. After a few hours, it became apparent that Ernie was having trouble relocating the exposed rock that had provided his sample. Asa had been sent to buy some burros and when he returned to camp a dejected Ernie told him that he had been unable to relocate the site. Asa asked him if he had marked the site with strips of cloth as he had been instructed to do. No, Ernie responded, only a tenderfoot needed to do that. And so, Ernie continued his search for months. As the years went by, the two would meet in Shoshone and relived their story. Asa agree not to divulge the story to anyone. He held to his promise until after Ernie’s death. His article appeared in Desert Magazine. Louise Grantham and Dot Ketchin arrived in Death Valley in 1926. They came west to find the prospector that Louise’s father had grubstaked and who had not written to him for a time. They found that the prospector had purchased mining equipment but had abandoned the claim and moved on. Two young college educated women who’d traveled 2,000 miles in a 1920s vintage motorcar found themselves facing an uncertain future in the lonely depths of Death Valley. Dot told me that the miners that they met, though rough around edges, were complete gentlemen to them and very helpful. The one that most impressed her was Ernie Hahn who convinced them to stay and help him work some of his gold claims which they agreed to do. 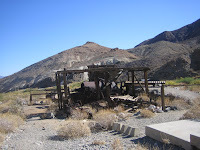 They eventually constructed a gold reduction mill at Warm Springs, one of the few flowing waters at the south end of the valley. This became their main camp and base of operation. Over the years a partnership was formed with Louse handling the business end and Ernie handling production of the gold mines. To secure rights to the spring, they filed papers for a mill-site with the county. The filing was contested by a Shoshone Indian who claimed that his family had established historic rights to the spring. The Park Service joined with the Indian in a law suit that followed. After a costly battle in the federal courts, the partners prevailed in securing rights to the spring. Louise Grantham gave no quarter to federal authorities or anyone else questioning rights to her mining claims established under the 1872 Mining Act. She carried a pistol and wasn’t afraid to use it. According to one story, she caught a miner who owned a nearby claim stealing equipment. According to Ernie, “she stuck her 45 in the miner’s belly with the safety off” – shades of the Old West. The partners held a number of talc deposit claims located along the walls of Warm Springs Canyon. As the country entered World War II, the price of talc soared. Its use in the manufacture of special paint for war ships and other war products brought the mines to full production. The white powder was trucked to the Union Pacific siding at Dunn located ten miles east of Yermo. Louise and Ernie became very rich. 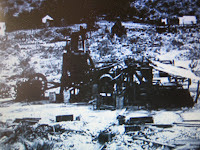 The Grantham Mines were sold to Johns-Manville in 1973. The new owner continued to mine talc for a few years until falling prices and declining quality of the talc eventually brought an end to all operations. The National Park Service now has title to the properties which are open to the public. After the mining properties were sold, Ernie, until his death in 1952, lived in a house that he built in Shoshone. After leaving the Warm Springs Mine, Dot Ketchin opened a boutique shop in Ontario, California and later moved to Laguna Beach where she died in 1984. What about Siberian Red’s lost ledge? Well the story never caught much attention or caused any excitement among treasure hounds. Like most lost treasure this one follows standard form: We found it, we didn’t get back to it for a while, when we did we couldn’t find it. For that reason I haven’t put much stock in this yarn -- but then, with the price of gold today, maybe Asa’s article is worth a closer look. 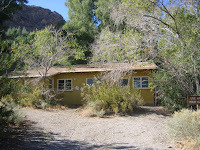 I took the following photographs on my recent visit to Warm Springs Canyon. The Gold Hill Mill, constructed in 1933, brought together a number of interesting devices for the reduction of ore. Here is my understanding of how they worked. The ore was hauled from the mines to the mill by truck and dumped into the ore bin atop two machines that pulverized the ore. The reduced material then entered the “classifier” that screened and separated the heaver gravels from the lighter sands. The gravel material circled back to the crushers for further size reduction while the sand material flowed onto and down a series of “shaker tables” where a back and forth shaking motion combined with gravity caused the heaver gold to be captured between wooden slates as the lighter sand particles sifted off of the tables as waste. In later years, an arrastre was constructed on the east side of the mill. Some believe that it was used to extract gold from the waste pile through amalgamation with mercury. Headquarters of the Grantham Mine, nestled among the trees and shrubs near the spring, include a bunkhouse for the miners, a house and dining area, and an office. All of the buildings are present and in good condition considering their age. Talc mines can be seen on both sides of the canyon as you approach the Warm Springs. The one depicted here is located about a quarter-mile east of the spring on the south canyon wall. 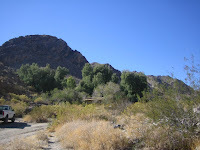 The dirt road into the canyon is maintained (bladed) and passable all the way to the springs. There is a sign “Warm Springs Butte Valley” at the entrance from West Side Road. This drive has become popular especially by desert four-wheel clubs.